I have always enjoyed Ciacci Piccolomini D'Aragona's wines, from the first time I visited them a number of years ago, and was given a quick tour of the cellars by (I think) Giuseppe Bianchini, who inherited the winery when the last of the Ciacci Piccolomini D'Aragona died in 1985. I remember being greatly impressed by the botti used to store the Brunello, and while I have seen a great many more since then, their cellar remains one of the nicest I have seen. Much has changed since then, for better and worse. Giuseppe was an extraordinarily dynamic winemaker, and wasn't completely satisfied by the setup in the basement of the family home: It wasn't practical. So he laid out the plans for a new winery, to be made mostly underground to guarantee temperature control, with temperature controlled steel fermentation tanks, many more botti for the Brunello, and lots of space to store bottled wine too -- remember, that though Brunello still must age for 4 years prior to release, the regulations governing its production now allow producers to bottle it after two years if they want, and then store it in glass until release. Alas, Giuseppe sickened, and though he did live to see the tanks in the new cellar, the task of finishing the project has fallen to his children, Paolo and Lucia, who have done a remarkable job. We tasted the Brunello Pianorosso, which is a vineyard selection from an 11.69 hectare (about 26 acres) vineyard whose altitude ranges from 240 to 360 meters ASL; the grapes are fermented in steel, where the resulting wine also undergoes the malolactic fermentation, after which it spends 3 years in large wood prior to bottling and bottle aging for about 4 months. This is a Vigna di Pianrosso, but they didn't say so on the label. The wine is almandine ruby with almandine rim tending towards orange. The bouquet is powerful, and haunting, with elegant green leather and leaf tobacco mingled with balsamic notes and considerable graphite shavings, with underlying brambly tart acidity. Demands and gets attention. On the palate it's full, with rich lacy red berry fruit, sour cherries in particular, supported by lively sour acidity and tannins that have a velvety lining over a slightly astringent core, and flow into a warm clean tannic finish that lasts and lasts. Quite nice, and vibrantly young in a distinctly traditional key; it has a lot to say, and though quite nice now is still climbing. I would enjoy it with a meal -- a porterhouse steak, and we'd be nearing perfection. Almandine garnet with orange rim -- it's paler than the 90. The bouquet is a bit wild, with stable straw and wet horse mingled with balsamic acidity and some underbrush, and herbs, a mix or rosemary and a little mint; it's mature in a robust traditional key. On the palate it's full, and much softer than the 1990, with fairly rich slightly sour cherry fruit that has a languid feel to it, supported by smooth sweet tannins that are velvety, and smooth -- none of the aggressiveness of the 90 -- and it all flows into a clean long soft sour cherry finish. It's from a lesser vintage than the 90 -- I recall that it rained heavily from September 20th on -- but I found it growing upon me as time passed and I continued to swirl it in my glass. If you like the more traditional expression of Brunello, it is a wine well worth seeking out. Deep black almandine ruby with almandine rim. The bouquet is fairly bright, with balsamic notes mingled with hardwood ash and some dried herbs, in particular sage and rosemary, with swishing it opens nicely, revealing saddle leather and leaf tobacco with some dried floral accents. Quite a bit going on. On the palate it's moderately full, with elegant slightly sour red berry fruit supported by smooth velvety tannins that have a distinctly cedary burr, and flow into a clean smooth fruit laced finish with tannic underpinning. It's elegant, though there's an emptiness to it too -- the summer was quite wet, and the grapes, which had sucked up a great deal of water, would have been ruined had the September sunshine not shrunk the bunches; though they did ripen well they weren't as balanced as they might have been, and this is reflected by the wine. It will nicely complement foods, though it's also round enough to be appreciated far f rom the table. Deep garnet with black reflections and some almandine in the rim. The bouquet is powerful, with rich red berry fruit laced with heather and herbal accents -- rosemary and a hint of sage, not greenness -- and some underlying balsamic notes. Quite elegant, and extremely harmonious; it's rather like listening to the play of notes in a Mozart sonata. On the palate it's full and rich, with elegant cherry fruit supported by ample tightly woven velvety tannins, while there is deft acidity to provide direction, and it flows into a chewy fruit finish with deft tannic underpinning. It's quite elegant, in a softer, less aggressive key than some of the earlier vintages, especially the 1990, and is thus more approachable; it would almost rather drink it far from the table rather than with a meal, though it will work nicely with hearty red meats too. From a magnum. The wine is lively almandine cherry ruby with some orange in the rim. The bouquet is deft, and beautifully balanced, with red berry fruit, sour cherry with some black currants, supported by rosemary and sage with some underlying spice and pleasant alcohol. On the palate it's full, and deft, with intense red berry fruit supported by clean smooth sweet tannins that flow into a clean fruit laced finish with tannic underpinning. Quite nice, though it's still very young, and has a long way to go -- you could drink it now, but it will reward those who have the patience to wait at least 5 years. Deep cherry ruby with black reflections and almandine rim. The bouquet is rich, and very young, with bright red berry fruit supported by spice and powerful chewy ripe yellow peach that's unusual in a red wine but nice, and is likely attributable to the phase the wine is passing through (peaches do occasionally appear in young Brunello); one has the impression of looking in on a toddler. On the palate it's full and rich, with powerful red berry fruit supported by smooth sweet tannins that have a youthful bitter burr to them, and flow into a clean rich berry fruit finish with bitter underpinnings; by comparison with the older wines, and especially the 1990, it is much less acidic, and is consequently much more approachable, though it does need time. It will drink very well now with succulent red meats, e.g. roast beef cooked rare, but will richly reward those with the patience to wait another 5-10 years, and hold further. In short, a wine to set aside. There is a stylistic progression in the wines, from frankly traditional with much more marked acidities and balsamic overtones in the older wines, to a smoother, richer, more fruit driven style in the more recent wines. Some of this change is certainly attributable to a greater understanding of ripening -- in the past, people waited until the sugars were sufficient to provide the desired alcohol content, while now they wait for the grape skins to ripen, producing more substance (i.e. fruit) and smoother richer tannins. And some of the difference may be age-related: as fruit fades with time the underlying acidity becomes more apparent. They are, in any case, very nice wines, and I especially liked the use of large wood, which allows the grapes to come through, without the oaky overlay that comes with the use of barriques. If you want to get a handle on Brunello, Ciacci Piccolomini D'Aragona is a good place to start. The vineyards are located in the Communes of Carmignano and Poggio a Caiano, on hillsides whose elevations range between 50 and 200 meters above sea level; this is lower than Chianti Classico, where the elevations range from 200 to 600 meters above sea level, and as a result daytime temperatures are warmer during the summer months, and this hastens the ripening and therefore the harvest, which is usually a couple of weeks ahead of Chianti Classico's. Carmignano is also just a few miles from the higher peaks of the Appennines, and because of this proximity it gets the night breezes, which bring temperatures down sharply, thus guaranteening good temperature excursions that helps the bouquet to develop. 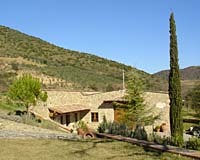 These mountains also bring the occasional summer thunderstorm, the rainfall from which, according to Count Ugo, helps maintain balance in the vineyards and further promotes ripening. 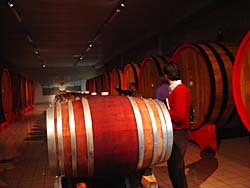 In addition to Carmignano DOCG, the region's producers also make several DOC wines. The most intriguing, from a historical standpoint, is Vin Ruspo (literally, stolen wine), a wine patterned after the wine the share-croppers used to make on the sly, by taking the last load of grapes home each day of the harvest, and keeping the juices that ran from the baskets during the night. It's a dry, fruity rosé. There is also Barco Reale, a lighter red named after a walled Medici Family hunting preserve located in Carmignano; it's designed to be drunk sooner than Carmignano, and is similar to Rosso di Montalcino in this respect. And finally, there is Vinsanto, the traditional Tuscan dessert wine made from white grapes allowed to dry on straw mats until mid-winter before they're pressed. A couple of words on the wines presented this year: First, I found the whites to be frankly average, and generic too -- too much wood anonymises them. On the other hand, with the exception of Vinsanto, Carmignano's winemakers justly devote most of their energies to their red wines. The 2005 Vin Ruspo is, as one might expect, quite up-front, but pleasant, and fairly rich. A fine wine for a picnic or cookout, and also well suited to light entrees. The 2005 Barco Reale is fairly light, and I found it to be graceful as well, a nice wine to enjoy with hearty winter legume-based soups, meat-based pasta dishes, and lighter stews or grilled meats. Most of the Carmignano Base poured was from the 2004 vintage, and I enjoyed it; with respect to the 2003 poured last year, the 2004 vintage displays considerably greater depth and deftness, and though a few of the wines had jammy notes, there was nowhere near as much overripeness. Bottom line: the 2004 vintage is quite pleasant, and will contribute nicely to a meal at which it is served. 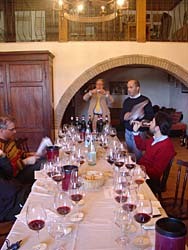 The 2003 Carmignano Riserva must instead be approached with greater caution; though the winemakers were able to partially mitigate the effects of the very hot summer though careful grape selection, the wines display neither the richness nor the balance one finds in a more balanced vintage. Pale brassy yellow with bright brassy reflections and white rim. The bouquet is bright, and fresh, with fairly intense mineral notes mingled with some heather and slight mint, supported by breezy alcohol and slight bramble. On the palate it's fairly full, and lively, with bright sour apricot fruit supported by mineral acidity and slight white pepper that adds depth, and it all flow into a clean rather bitter, slightly savory finish. It's muscular, but moves nicely, and will work well with flavorful soups or vegetable-based pasta sauces -- a summery primavera sauce with eggplant comes to mind -- and also with richly flavored fish or white meats; because of its power I might also be tempted to serve it with light curries or perhaps dishes of the more richly spiced Chinese schools. Lively rose with brilliant rose reflections and white rim. The bouquet is fresh, and rich, with lively raspberry cherry fruit supported by some berry fruit jam -- sweet strawberry -- and by an abundance of violets. Pleasant, cheeky youth in a glass. On the palate it's medium bodied, with bright slightly sour red berry fruit supported by deft sour raspberry acidity, and by clean light tannins that lead into a moderately long berry fruit finish with underlying bitterness. Quite nice, and will be perfect at a cookout or picnic; it will also be nice indoors, with hearty legume based soups, meat based risotti, or with quickly cooked meats. Because of its lively acidity I would also be tempted to serve it with mixed fired meats, and it could work well with oriental dishes as well. In short, versatile, and you may want a second bottle. Fairly deep slightly cloudy cherry ruby with cherry rim. The bouquet is fresh, with moderately intense red berry fruit supported by considerable mint and some bitter vegetal notes mingled with graphite shavings. Young, and direct, but with pleasing complexities too. On the palate it's medium bodied, with moderately intense slightly bitter red berry fruit supported by clean slightly bitter tannins that gain direction from some deft acidity, and flow into a clean fruit finish with bitter undertones. It's graceful, in a fairly light key, and will drink quite nicely with grilled meats or light stews, be they red or white meat. Expect the bottle to go quite quickly, and you will likely want another handy. Seep pigeon blood ruby with cherry rim. The bouquet is powerful, and a bit overripe, with jammy red and black forest berry fruit, a mixture of cherries and black currants, with a fairly intense vegetal overlay that adds depth, and hints of cedar as well. On the palate it's full and soft, with ample red berry fruit that has slight gum Arabic overtones, and is supported by tannins that are initially smooth and sweet, but display bitter cedar notes as well as they flow into a clean bitter tannic finish. It will drink well with succulent red meats off the grill, or with rich meat-based pasta dishes, and will age nicely for 3-5 years. Deep pigeon blood ruby with cherry rim. The bouquet is closed, though swishing brings up some red berry fruit and underlying graphite bitterness. On the palate it's medium bodied with moderate fruit, supported by considerable cedar that lays a veneer over the tongue and creeps over the roof of the mouth; it's lacking in fruit, and though the wood steps in it can only do so much. Drink it with red meats. Deep pigeon blood ruby with black cherry rim. The bouquet is closed, though swishing brings up cedar and some peppery spice. Not much fruit. On the palate it's richer than the nose suggests, with fairly bright red berry fruit supported by greenish citric acidity, and by tannins that have an angry green burr and flow into a warm greenish finish. It's very much a child of a hot summer, and as such is disjointed, though I found myself preferring it to some of the smoother, softer, more overripe wines poured. I would drink it with a succulent steak, or perhaps roast leg of lamb. Deep pigeon blood ruby with black reflections and almandine rim. The bouquet is fairly rich, with greenish cedar and spice supporting underbrush and some, but not too much berry fruit. On the palate it's full and soft, with ample cherry plum fruit supported by smooth sweet tannins that have distinct cedary overtones. Weak, and already settling. Tawny amber with amber reflections and greenish brown at the rim. The bouquet has alcohol and some toasted hazelnut, but not much in the way of other dried fruit or nutmeats. On the palate it's full and sweet, with moderately intense dried apricot that gradually emegers from the sweetness, gaining warmth and walnut skin notes that carry though at considerable length. It's fairly direct, but pleasant, with the second sip exciting considerably more interest than the first, and will drink nicely sipped far from the table. Lively brassy yellow with brilliant brassy reflections. The bouquet is fairly intense, with very ripe slightly bitter pineapple fruit laced with sea salt and asparagus greenishness with underlying cedar as well. On the palate it's full, and rather languid, with ample smooth minerality supported by moderate acidity, and by white pepper spice that gradually gives way to butterscotch, which carries at length into a mineral finish. It's pleasant enough in a fairly international key, though not truly distinctive -- I found it more interesting on the nose than the palate -- because of its softness on the palate I would drink it with more delicately flavored fish dishes. Deep black cherry ruby with black reflections and cherry rim. The bouquet is unusual, with a rush of yellow peaches that I associate more with whites than reds, but works nicely here, supported by graphite bitterness and some greenish peach fuzz. On the palate it's medium bodied, with fairly rich cherry fruit supported by ample smooth sweet tannins that flow into a clean berry fruit finish that gains definition from graphite bitterness. Deft, and it will drink well with grilled meats or light stews; I would give it a year to see how the nose develops -- it's in mid stride now -- and expect it to hold well for another 5 at least. Deep brassy gold with old gold reflections and pale gold rim. The bouquet is powerful, and sweet, with considerable butterscotch mingling with freshly crushed mint leaves and some greenish spice; there's considerable concentration to it, and though the wood is quite evident it's not bothersome. it. On the palate it's full, and at the same time oddly empty; there is a structure to it that clearly derives from the oaken barrels, but there really isn't enough fruit to fill the structure, which therefore stands on its own -- well -- without much in it; the finish is long, with butterscotch and herbal notes. It gives an impression of trying too hard, though it is well made, and if you like this strongly oaked style you might want to consider it. I found it a bit much. Deep tawny gold with brilliant golden reflections. The bouquet is fairly intense, and intensely mineral, with underlying butterscotch laced with bitter honey, moderate mineral (more than citric) acidity that is enough to confer brightness, and freshly struck gunflint bitterness with smoky overtones. On the palate it's full, and rather languid, with fairly intense gunflint-laced minerality supported by bitterness more than acidity, and it flows into a fairly long bitter finish with butterscotch overtones. The wood, which is quite evident, has settled it a touch more than I might have liked, but it holds together harmoniously, and will work nicely as an aperitif or with delicately flavored fish dishes. I found it growing on me. Lively black almandine ruby with black reflections. The bouquet is out of step with the other 2004 wines: quite wild, with eye-opening balsamic berry fruit supported by animal tang -- not quite horse pee but animal -- and greenish vegetal notes. On the palate it's medium bodied tending towards full, with bright red berry fruit that gains direction from some acidity, and is supported by cedar-laced tannins that flow into a clean cedar laced finish with brambly berry fruit. It's particular, and you have to like this sort of wildness, but if you do it will work quite well with succulent red meats, for example a porterhouse cut. Almandine ruby with black reflections and almandine rim. The bouquet is greenish, with pronounced vegetal notes mingling with damp hardwood ash, and some peppery spice. Not much fruit. On the palate it's full and soft, with ample slightly bitter cherry plum fruit supported by tannins that have a warm splintery burr, and flow into a warm clean finish. A child of the vintage, but more successful than some, and though I wouldn't drink it far from the table the tannins are sufficient to balance stews or roasts that aren't too rich. Tawny amber with apricot reflections. The bouquet is unusual, with a mixture of sea salt, spice, and cedar that and brings to mind pellet fertilizer. One writes what one smells. On the palate it's full, and sweet, with peppery medicinal overtones that carry on into a long hot finish with some walnut skin overtones. I found it to be rustic. Lively gold with old gold reflections and white rim. The bouquet is powerful, with fairly intense vanilla and butterscotch mingling with mentholated spice and some honey. On the palate it's full, with fairly bright acidity supporting a mixture of citric and ripe tropical fruit, with underlying minerality and butterscotch that carries into a long warm finish with a fair amount of acidity. It's all right, but not exciting, and will drink well with cheesy risotti or pasta dishes, lighter white meats, and flavorful fish dishes..
Lively rose ruby with brilliant reflections. The bouquet is moderately intense, with a pleasant mixture of red berry fruit and herbal notes, a mixture of mint and some sage, supported by deft acidity. A fair amount going on. On the palate it's full, with bright cherry raspberry fruit supported by moderate bitter acidity and by light, sweet tannins that add depth. It's pleasant, in an upfront key, and will drink well with simple first course dishes, though I would be more tempted to serve it at a cookout or picnic, or with a platter of mixed fried meats and vegetables. Expect it to go quickly. Lively pyrope ruby with pyrope reflections and ruby rim. The bouquet is very fresh, with a rush of cherry black currant jelly mingled with violets and some berry fruit, though what really stands out is the jelly, which is joined in time by vegetal notes. On the palate it's full on the outset, and quite smooth, with ample stewed black cherry and black currant fruit supported by tannins that start out velvety, but reveal warm greenish notes that increase as they lead into the finish, which is warm and fruit lace. It's unusual, and particular; unless you like these very ripe aromas and flavors it won't work for you. It will drink well with relatively drier meats. Impenetrable pigeon blood ruby with violet rim. Charged, and looks young. The bouquet is intense, with deft red berry fruit laced with greenish vegetal notes that add depth, and cedar-laced bitterness as well. Harmonious in a youthful fairly international key. On the palate it's full, and quite smooth, with rich cherry and black currant fruit supported by ample smooth sweet tannins that flow into a clean black currant finish that resolves fairly quickly into cedar-laced tannic bitterness. It's pleasant, but a touch short, though this may be youth; it is in any case a wine you should consider only if you like smoother, softer reds. If you prefer scrappy aggressiveness and acidity it won't work for you. Drink it with succulent, not too fatty red meats, including, for example, roast beef cooked medium. Impenetrable black cherry ruby. Poured ink. The bouquet is fairly rich, with bright red berry fruit jam that gains direction from some cedar, and from greenish vegetal overtones that also provide direction. On the palate it's full, but oddly lacking in fruit; much of the structure comes from cedar laced tannins, while the fruit present, primarily very ripe berries with some plum, doesn't quite fill the house it has; the finish is a pleasant surprise, because there is sufficient acidity to keep it all from flagging, and this makes it one of the more pleasant than many of the 2003 wines. It will drink nicely with succulent, but not too fatty red meats. Deep pyrope ruby with black reflections and cherry rim. The bouquet is fairly rich, with berry fruit jam mingling with cedar and some greenish notes, and underlying peppery spice. On the palate it's full, with rich slightly jammy red berry fruit that gains direction from some acidity, and is supported by clean sweet tannins that have sweetish vegetal overtones and flow into a clean slightly bitter berry fruit finish with lasting warmth. It's disjointed by comparison with a more balanced vintage, but does display a certain grace, and will drink nicely with succulent red meats, be they off the grill or roasted. I wouldn't age it for too long, but in the short term it will be nice. Tawny amber with pale greenish brown rim. The bouquet is moderately intense, with quite a bit of alcohol mingled with walnut skins and sea salt, and underlying dried fruit and shellac. On the palate it's full, and sweet, with powerful dried apricot fruit that gradually merges from a layer of oatmeal, as it were, accompanied by considerable warmth and walnut skins, which go on and on. A pleasant surprise, this on the palate, and it has quite a bit to say. A wine to sit down with and listen to. Pale rose with bright rose reflections and white rim. The bouquet is a bit unsettled, with an initial rush of sulfite, which is added at bottling to stabilize the wine, and settles out with time -- that gradually fades with swishing to reveal pungent cut flowers, which in turn open to reveal strawberries with some slightly greenish hulls, and slight brambly undertones. It's pleasant once it casts aside the sulfite, in a rather tomboyish key. On the palate it's medium bodied, with fairly intense red berry fruit supported by moderate acidity, and by moderate tannins that flow into a clean moderately long berry fruit finish that gains definition from sour overtones and underlying bitterness. It's direct, and up front, and will work well as a picnic or cookout wine, or with simple first course dishes, and might also be a good bet with not-too-spicy pizza. Lively ruby wblack reflections. Looks young. The bouquet is bright, and fruity with an abundance of red berry fruit supported by equally intense violets -- graceful youth in a glass, and quite fresh. On the palate it's medium bodied, and lighter than I expected from the nose, with moderately intense rather bitter red berry fruit that gains direction from bitter acidity, and is supported by fairly light smooth tannins that flow into a bitter fruit laced finish that gains brightness from cherry acidity. It's quite direct, and if you like wines that have a bitter edge to them you will enjoy it with simple first course dishes --hearty soups, especially legume based soups, meat based pasta dishes, or quickly cooked meats. Burgers would be good. Fairly deep cherry ruby with black reflections. The bouquet is closed, though some graphite shavings and moderate berry fruit do emerge. It needs time. On the palate it's medium bodied, with deft slightly sour red berry fruit that gains direction from greenish acidity, and is supported by smooth sweet tannins that flow into a warm fruit laced finish. It won't stand out at a tasting, but will drink quite well with foods, which is what wine is all about. I'd give the bouquet a few more months, and then drink the wine with something off the grill -- perhaps cutlets more than a porterhouse -- and might have a second bottle handy. Deep pigeon blood ruby with some almandine in the rim. The bouquet is fairly intense, with red berry fruit supported by slightly balsamic hardwood ash with underlying acidity and peppery spice. On the palate it's mature, with full fairly rich red berry fruit that gains direction from some citric acidity, and is supported by ample smooth tannins that have slight cedary and vegetal overtones, and flow into a clean berry fruit finish with hints of leaf tobacco and bitter overtones. Pleasant, and entering maturity; it will drink nicely with succulent grilled red meats, including richer fare such as lamb or a thick steak. Though it's ready, it will age nicely for another 3-5 years at least. Impenetrable pigeon blood ruby with black reflections and cherry rim. The bouquet is closed, though swishing brings up cedar and some cooked berry fruit mingled with greenish spice. On the palate it's full, and soft, with ample plum cherry fruit supported by smooth sweet tannins that flow into a clean plum laced finish with bitter overtones. It's soft and overripe, both things to be expected given the vintage, but manages a certain grace, and will drink well with drier meats. Lively cherry ruby with black reflections. The bouquet is fresh, with bright cherry and blackberry fruit that gains depth from graphite shaving bitterness, and also from some underlying berry fruit jam. Pleasant, and invites a second sniff. On the palate it's lighter than I might have expected from the nose, to the point of feeling a bit empty, with moderately intense red berry fruit that gains definition from pronounced bitterness, and is supported by clean sweet tannins that flow into a fairly long berry fruit finish with underlying bitterness. Though it is harmonious does hold together I'd have liked greater fullness to the fruit; it will drink well with meat-based pasta dishes, or quickly cooked red meats. Pigeon blood ruby with slightly cloudy cherry ruby rim. The bouquet is bright, with considerable berry fruit jam mingled with bright cherry acidity and a pleasing undercurrent of violets and red berry fruit. Harmonious. On the palate it's medium bodied and surprisingly soft, with fairly rich slightly jammy berry fruit supported by smooth sweet tannins that gain direction from slight vegetal bitterness, and lead into a clean bitter finish. It's pleasant in a youthful fruit driven key, though you have to like wines that are quite soft -- if someone had asked me what was in it I might have guessed Merlot -- and will drink well with drier meats, either red or white. For example, roast turkey roll, or perhaps a pot roast. Deep pigeon blood ruby with black reflections and cherry rim. The bouquet is fairly intense, with moderate red berry fruit supported by strong greenish vegetal notes laced with sea salt, and some underlying berry fruit jam. On the palate it's full, and sweeter than I might have expected, with fairly rich red berry fruit that has jammy overtones, and is supported by ample smooth sweet tannins that flow into a fairly sweet berry fruit finish. It's a bit overripe, and as a result a touch soft, and therefore will drink well with drier meats, rather than richer fatter fare. Impenetrable pigeon blood ruby with deep pyrope rim; it looks like poured ink. The bouquet is closed, though swishing brings up some berry fruit laced with cedar and India ink. Quite a bit of wood. On the palate it's ample and quite smooth, with full soft plum fruit supported by smooth sweet cedar laced tannins that flow into a clean cedar laced finish with lasting bitterness. It's overripe, and quite soft, though not unpleasant if you like this style. If you prefer wines that are tighter, it won't work for you. Because of its softness, I would drink it with drier meats, either red or white, and again, because of its softness, I wouldn't age it for too long. Impenetrable pigeon blood ruby with some almandine cherry in the rim. The bouquet is overripe, with airy plum fruit supported by savory spice and hardwood ash. On the palate it's full and smooth, with ample plum cherry fruit that gains some direction from slightly metallic bitterness, and is supported by ample smooth tannins that work from below the surface, as it were, and lead into a bitter tannic finish. It's very much a child of the vintage. Impenetrable pigeon blood ruby. The nose is shut tight, with moderate cedar and full and soft, with ample plum fruit supported by smooth soft tannins that work little if any fruit emerging. On the palate it's smooth and soft, with moderate fruit and tannins that work from beneath the surface. Yet another hot weather wine. Deep pigeon blood ruby with black reflections. The bouquet is overripe, with berry fruit jam that has bell pepper overtones, and is supported by greenish notes and acidity. On the palate it's medium bodied, and frankly vegetal, with moderate red berry fruit that is completely overshadowed by the vegetal notes, while the tannins are greenish and strident. A textbook hot weather wine, and though the tannins will smooth with time there isn't much fruit to back them up as they smooth. Pale amber with brilliant apricot reflections. The bouquet is rich, with dates and dried figs mingled with nutmeats and alcohol, and slight rancio, with underlying oatmeal and some brown sugar. Quite a bit going on, in a fairly modern key. On the palate it's full, and rich, with dried apricot fruit that rapidly gives way to walnut skins and warmth that carry on at great length, leading into a warm walnut skin finish. Elegant, in a fairly international key, and pleasant, though I might have liked slightly more intense fruit following the initial attack. Deep slightly cloudy pigeon blood ruby with cherry rim. The bouquet is fairly intense, with red berry fruit supported by ample bitter cedar and some brambly notes with underlying bitter peppery spice. On the palate it's full, with fairly rich very smooth berry fruit that's overshadowed by oaky notes that carry though into the finish, while the tannins have distinct cedar to them. It's young, and a bit disjointed, and though the oak will fade some with time, it may never completely cast off this oaky mantle it bears. Because of the bitterness in the cedar overlay it will drink well with succulent, juicy red meats. Deep pigeon blood ruby with some almandine ruby in the rim. The bouquet is rich, with red berry fruit supported by deft cedar and some hardwood ash, and underlying berry fruit acidity and hints of graphite shavings. Refreshing, and pleasant to sniff. On the palate it's full, with softer, riper berry fruit than I might have expected from the nose, supported by ample sweet smooth tannins that gain direction from cedar-laced bitterness, and flow into a clean bitter plum finish. Pleasant, though I found it to be a bit overripe; because of its softness it will work well with drier meats rather than really fatty fare off the grill. Say roast beef cooked medium. Impenetrable pigeon blood ruby with black cherry rim. The bouquet is fairly intense, with India ink and cedar mingled with warmth, but not much in the way of fruit. On the palate it's full, with ample plum fruit supported by soft sweet tannins that have India Ink bitterness and flow into a soft smooth plum laced finish. It's clearly overripe, but the fruit holds better than it does in many of the other 2003 wines, and as a result I found myself liking it more, though I wouldn't set it aside to age by any means. Rather, drink it with well done, and thus drier meats, for example roast beef well done. Impenetrable pyrope ruby with deep cherry rim. The bouquet is moderately intense, with cedar, India ink, and some gum Arabic, but not much fruit. On the palate it's unbalanced, with considerable warmth and a great rush of cedar that lays a veneer over the tongue, but not much fruit to back up the veneer. There's concentration in spades, much from wood, and I'd have expected more fruit. It may clean up with time but I have to score what I see. Deep black almandine ruby with black reflections and almandine rim. The bouquet is moderately intense, with fairly rich bell pepper laced berry fruit jam supported by moderate acidity. On the palate it's full and smooth, with fairly rich cherry plum fruit that gains direction from sour plum acidity, and is supported by ample smooth sweet tannins that are fairly soft, but do provide direction, and lead into a clean slightly vegetal fruit laced finish. Pleasant, and though the child of a hot vintage does display a certain grace and depth; it will drink well with succulent red meats either grilled or roasted. Italians have always blended grapes to produce a sum greater than the parts -- the most obvious examples that come to mind are Chianti, traditionally a blend of Sangiovese and Canaiolo, with other lesser varietals including Colorino and Mammolo (now one often finds French varietals as well), and Valpolicella, which traditionally consists of Corvina Veronese, Rondinella, and Molinara (no longer required), with other lesser varietals. And people blend in Piemonte too; in Langa the traditional combination was Barbera, for lively acidity and aromas, and Nebbiolo, for backbone and grace. And a nice combination it is, but what to do outside of Langa, where the Barbera grows very well but Nebbiolo fizzles? Annalisa, whose Tenuta I Quaranta is in the Astigiano, decided to combine her Barbera with Cabernet Sauvignon, and I must say I was impressed. The 2004 vintage of Velours (lot 01 06) is deep, black cherry ruby, and has an elegant nose with bright, rich lively acidity mingled with ripe slightly sour cherries and currants, with deft slightly greenish vegetal notes that provide contrast and definition (Cabernet's contribution), and nice oak that bolsters but doesn't overshadow. A lot going on, and quite nice. The palate reflects the nose; it's lively and elegant, with a very nice balance between acidity and structure, with lively sour Barbera fruit complemented by shadowy greenish notes from the Cabernet, sweet rich tannins that have slight savory accents, and all flowing into a clean long finish with some bitterness and graphite. As I said, impressive, in a clean international key -- Leonardo Romanelli, whom I tasted it with, nodded and said it was nice to encounter a well-made modern style wine -- it has a pleasingly rich gracefulness, and is well worth seeking out to enjoy with grilled red meats, or light stews. It is quite drinkable now, but I would give it another year. Bottom line: A wine that works very well, and, I hope, gives others ideas. Barbera does complement Cabernet nicely, and I'd like to see more examples of this blend.